There are many things that can scare us in this life, but sometimes the biggest fears we have are created in our own minds. Have you ever geared up to have a conversation with someone for weeks or months, or even years? And every time you turn it over in your head, you think you can’t. You can’t get the words out because the pain will be too much; too much for you, or the other person. Maybe you play it out in your mind, looking for some way to become clear. What you’ll say, how you’ll say it, and what you hope they’ll say in response. Maybe you imagine the worst case scenarios, too. Meanwhile, you’re in a prison, time is going by, and your whole being is in agony. Pushing down the truth, whatever it is for you, is absolutely exhausting. Any painful conversation would be easier than the suffering we inflict upon ourselves when we just won’t face what we know in our hearts. Shame is a strangler. There is no way you’re “supposed to be”; you can only be you, fully, the most beautiful, authentic version of yourself. Other people may have expectations and ways they like to think of you. If those expectations and ways go against the very grain of who you are, if it just isn’t working for you anymore, then the people closest to you will have to change their expectations, or not. But you can’t deny the deepest longing of your soul. You can’t fight your truth and expect to win. You can make yourself sick trying, though. Sometimes we long to make changes but tell ourselves we can’t or shouldn’t. We run down the list of all the things that might go wrong, instead of all the things that might go right. We ask ourselves who we are to consider shining. The real question is, who are we to consider not shining? 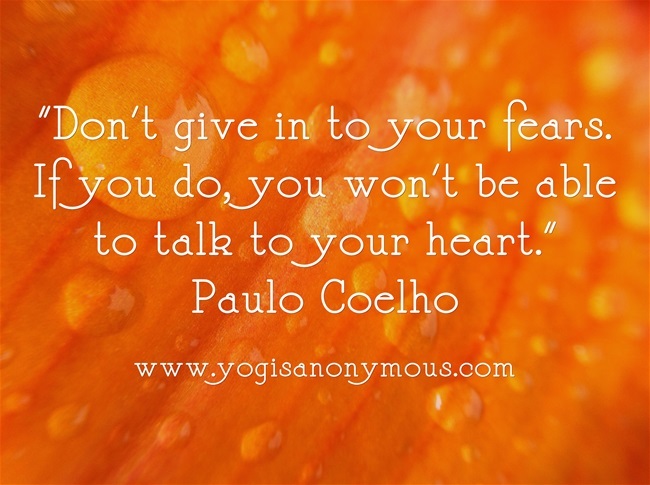 Fear can be debilitating, but we’ll all feel it, it’s perfectly natural. The more you open to it, the less hold it has over you. If you can acknowledge you’re afraid, you’ll find that releases the grip and you can breathe again, there’s space again. This is not an easy gig, this business of being human. We’re vulnerable and underneath the surface of our lives exist questions we’ll never be able to answer with absolute certainty until we exhale for the final time. It’s understandable that we want to cling to our plans and visions of how things should be. Presumably that, at least, is something we can control, but it isn’t, and we can’t. We are all evolving all the time, circumstances are shifting and changing all around us, and the reality of that groundlessness can be difficult to absorb. So we make our plans, and we feel afraid when they aren’t panning out the way we’d hoped. Now we have nothing to hold onto. There are people who cling to their pain because that’s all they’ve got. Without it, they have no clear sense of who they’d be, or how life might feel. Something we know is often more appealing than something we don’t, even if what we know, hurts. But life isn’t something to get through with our fists clenched and our eyes shut tightly. It isn’t something to be endured in quiet despair. It can be both of those things when we don’t face ourselves and embrace what’s true for us, though. It’s isolating and suffocating. The only person who can let you out of a prison you’ve created in your mind, is you. You may have fear of disappointing people, of not being what someone else wants you to be. The worst betrayal, though, is the betrayal of yourself. Too many people spend too much time and energy trying to be something other than who they are, as if what they are isn’t miraculous. When was the last time you ran into yourself at the grocery store, or on line at the movies, or at the park, or when you were traveling on the other side of the globe? You’ve never run into yourself anywhere, because you’ve never existed before, and you’ll never exist, exactly as you are, again. You have one shot in this life, in the body that you’re in, with the experiences you’ve had and the way you look at the world. One chance to sing your song and accept yourself and shine it out. It would be a shame if you let fear stop you. Feel it, and go there, anyway. Otherwise you rob the world of a gift it can never have any other way. You rob the world of the gift of you. This is the thing about the mind: If you don’t get a hold of it, it will head into the past or into the future, and pull you right out of the present moment. 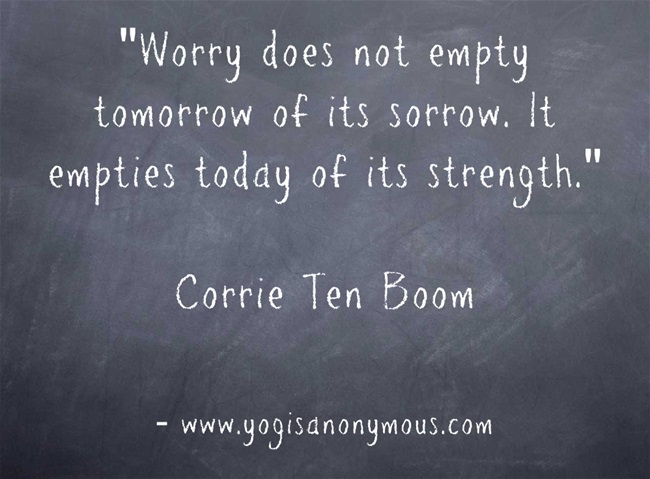 Worrying is nothing more than creating a state of anxiety about an event that may or may not come to pass. Worrying will not magically add money to your bank account, or have any effect whatsoever on any situation in your life, except that it will make you sick. Sick with tension. Being tense doesn’t help anything, either. It just makes it hard to eat or sleep. Sleep deprivation will also wear you down and make your thinking muddy. So why do we do it? When we worry, it’s an attempt to control or predict a future outcome, or it’s an attempt to manage another person’s path. We run every awful scenario through our heads and rehearse our possible reactions. And in so doing, we both over-estimate and under-estimate our power. Of course if you love someone and they are in trouble, worrying about their well-being is natural, but it’s not going to help them. Using your energy to be a source of strength is a lot more helpful. Extending an ear, a shoulder, a hug, tangible support if you’re in a position, are all much more useful than your worry. And sometimes we can love people who are on a path to hurt themselves, and at a certain point, if they’re determined enough, there’s not much we can do but be there. We can’t save other people. There are times we get ourselves completely worked up over a non-event, a non-issue. Obsession has a very similar set of side effects as worry. When we boil ourselves over a past event or a predicted outcome, although the event isn’t taking place in the present, it might as well be. Because when we fixate on something like a conversation that didn’t go the way we wanted it to, or one we’re anxious about having, we create a set of circumstances in the body that are not much different than they would be if this feared or unfortunate thing was happening right now. Or than they were when the past event happened. Your blood pressure doesn’t differentiate between an actual event or an imagined one if you get yourself worked up enough. Next time you’re “boiling yourself”, notice your shallow breath, your tensed shoulders, your clenched jaw, your furrowed brow. Your body is in a state of stress, and your mind has created it. Sometimes logic helps. If you catch yourself spiraling, see if you can pull yourself out of it with a few questions: Is the way I’m thinking going to help in any way? Is it a productive way for me to think? Is it going to help me grow and open and learn something about myself? Am I in a state of resentment and blame? Is this a good use of my time and energy? If you come to the conclusion that no good will come from your train of thought, then you have to break out of the groove of it. Something physical usually helps a lot. For me it’s yoga, the movement and the breath, the awareness of sensation, the quieting of my mind, and the opening of my heart. But for some people it’s running, or wind-surfing, or gardening, or hiking. I do think moving your body and breathing deeply are key. If you can’t move your body because you’re stuck at work, then breathe deeply and consciously. If you can get out in nature, or even walk around the block, that is almost always soothing to the soul. Sometimes a dance party to the right song in your living room, or behind the wheel of your car is enough to shake the obsession off. But try to stop the tape and come back to now.